Miroslav Barnyashev, famous by his ring name Alexander Rusev is a Bulgarian professional wrestler and former rower and power lifter born on 25th December 1985. After receiving his wrestling training from former WWE stars Rikishi and Gangrel, Rusev started his career in 2008 at New Wave Pro Wrestling. In 2010, he signed a contract with WWE and was send to Florida Championship Wrestling where he adopted his ring name “Alexander Rusev” and later performed at NXT too. The WWE main roster debut of him came in early 2014 which made him the first Bulgarian to have wrestled for WWE. Since then, Rusev has earned a lot recognition and success through his performances in various storylines. As for his personal life, Rusev is engaged to Catherine Perry who as well performs for WWE under the ring name of Lana. 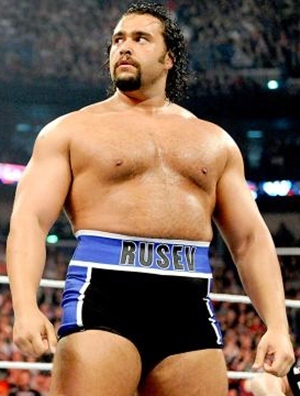 Below is the list of complete WWE wrestler Alexander Rusev body measurements including his weight, height, chest, waist, biceps and shoe size. Rusev is a first Bulgarian to be signed by WWE. His nick names include “The Bulgarian Brute” and “The Super-Athlete”. He is trained by the Grangel and Rikishi, the two WWE Attitude Era Superstars.